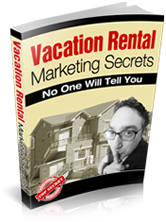 “Vacation Rental Marketing Secrets No One Will Tell You”, was written for anyone looking to make any money in the vacation rental market. It’s more than a book for marketing vacation rentals. It’s a guide teaching owners in an easy to understand way; how to market vacation rentals and resort properties online. In addition to its powerful marketing secrets the book also delivers the truths about vacation rental ownership and helps owners develop a better rental business. There is nothing like that sinking feeling you get in your gut when empty weeks go unrented. If you’re an owner you may know the feeling well. That feeling of knowing you just let money go out the window. Its difficult for owners to compete in this fast paced world of internet marketing. Jay has put his insider knowledge of marketing rentals and sales techniques in this revolutionary guide for vacation home owners to make it as easy as possible. If you’re a vacation rental owner just starting out the book contains important “Need To Know” information to help new property investors get started on the right foot. The book will increase your bookings and reduce the learning curve of owning a vacation rental property. It’s a complete guide for vacation rental marketing and investment ownership. If you’re a property manager, tour operator or travel agent who books vacation rentals online, you’ll need to get your hands on this book too. The vacation rental marketing plans and strategies will help your travel business get the exposure it deserves on the web! This book is for you even if you’ve been renting vacation rentals online for some time. Smart investors and business people understand the importance of improving and being on their Agame. Is your vacation rental’s marketing strong? If you would like to increase your current rentals and actual profits, look no further. This vacation rental guide for owners is the best resource available for marketing vacation rentals online. Jays secret vacation rental marketing tips will equip vacation rental owners AND property managers with secret weapons to pierce the armor of their competitors breaking through the barriers holding the owners back from gaining ground and true success on the internet. You can be successful marketing your vacation rental! You’ll learn how to cut out your own piece of the market and keep it! “Vacation Rental Marketing Secrets No One Will Tell You” was designed to enlighten owners and managers with the powerful vacation rental marketing ideas and techniques the professionals use to keep their properties booked. You’ll learn exactly how to drive in traffic from the internet into your rental property’s drive way. This entry was posted in Vacation Rental Marketing and tagged advertise vacation rentals, advertise vacation rentals online, advertising vacation rentals, free vacation rental advertising, free vacation rental marketing, marketing vacation homes, marketing vacation rentals, vacation rental advertising, vacation rental internet marketing, vacation rental marketing, vacation rental marketing blog, vacation rental marketing plan, vacation rental marketing site, vacation rental marketing tips, vacation rental marketing website, vacation rental site, vacation rental website, vacation rental websites, vacation rentals advertising, vacation rentals marketing. Bookmark the permalink.